So Christmas is technically over, but we're still allowed to be a little bit festive, right? With that being said, I thought I'd share this little gem of a company with you. I was contacted a little while back by a lovely brand called Go Customized* who kindly offered to send me one of their cases to review. I jumped at the chance, because 1) I literally always have to have a phone case on, as I am quite possibly the world's clumsiest human ever. 2) My history of smashed iPhones is pretty high, and 3) I'm always on the hunt for a new unique/ pretty case! Go Customized specialise in personalised phone and tablet cases, in which you can choose one of their images, or upload your very own. You can design the case as minimal or as 'out there' as you like, and you can even add text to give it slightly more personal touch. I was originally thought I would fail massively at trying to do this, but I was pleasantly surprised how simple & easy the design template actually is. I love how unique it is that you can choose your design and really make it your own. At first I was like "how on earth am I going to be able to decide on an image?! I can't even decide what to wear in the morning..'' but I knew if I couldn't decide, I always had their graphics to choose from. 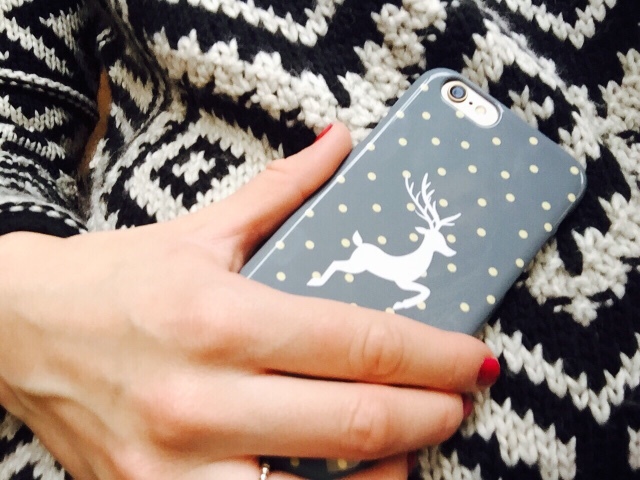 Alongside picking your design, you can also pick the style of case you would like too. They range from Wallet Cases, Leather Flip Cases, Full Wrap 3D Printed Cases, iPad smart covers and many more! I decided on a full wrap hard case with festive/winter theme - as I wanted something that could see me through the rest of the season (without looking like a crazed Christmas freak!) Ultimately, I picked this design from Pinterest, because it was a nice colour scheme and not too 'in your face'. As I'm clearly obsessed with anything deer looking at the moment, I thought this was a great ideer. Har har. Their prices are really reasonable for the quality you get and they're a nice snug fit for your phone, with cut outs for all your needs. To make your own iPhone 6 case, the prices range from £14.95 up to around £30 depending on your preferred style - which in my opinion is great value for money! Also if you order before 5pm, your order will be shipped the next day! We all love a bit of that, right?! All in all, I am so so pleased with my case and I haven't taken it off since getting it! I highly recommend this company to anyone who is in need of a new case or a nice personalised gift for someone! I wish I had time to post it before Christmas! Customized phone cases are the thing that makes your phone looks rejuvenate. Custom made phone cases are very cool way to show your personalized style. I personally use the custom made phone case. Thanks for sharing this.